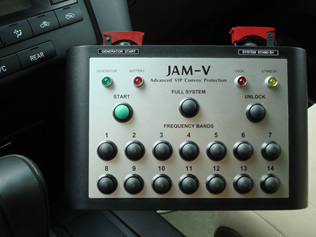 SESP is proud to offer the most advanced VIP convoy protection jamming system in the world, the "ready-to-drive" JAM-V. Two versions of the fully-installed convoy protection device are available: one is delivered in a luxury vehicle, and a more powerful version is delivered in a four-wheel-dive luxury vehicle. The JAM-V MK4 Mercedes S500L is a specially customized luxury vehicle, equipped with a fully-integrated broadband jamming system. The JAM-V system covers, continuously and simultaneously, the RF communication frequencies most commonly used by terrorists to detonate road-side bombs (RCIEDs): 66MHz – 2500MHz. Using the latest jamming technologies, this third generation of JAM-V now features ultra-high RF transmission power of 1000 watts, resulting a greater radius of coverage around the vehicle. 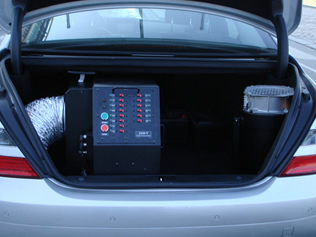 This state-of-the-art convoy protection device is installed in the trunk of the vehicle. The system is powered by a dedicated, specially-customized DC alternator which is integrated with the vehicle’s engine. The system features an integrated “active smart” cooling system which ensures uninterrupted operation in any climate. 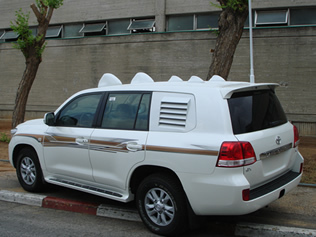 A set of high-gain, omni-directional antennas are mounted on the roof and the rear of the vehicle. 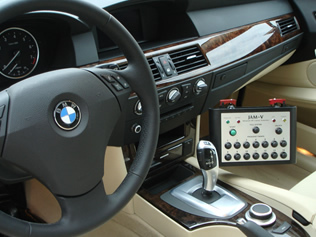 System management, including activation, operation and band control, is performed using a remote control unit installed covertly inside the vehicle’s driver-side console. Beyond the installation of the convoy protection device itself, the vehicle is customized with special RF shielding for full protection of the driver and passengers. Optional armoring to level B6 is available for all JAM-V vehicles. 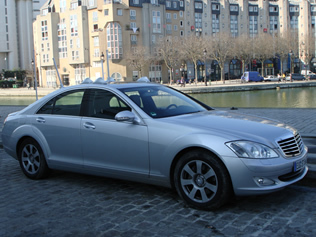 The customer may choose any luxury vehicle similar to the Mercedes S500L. For example, JAM-V has been delivered in a BMW 7 Series as well. There is simply no better way to defend your VIP from the threat of radio-activated roadside bombs. 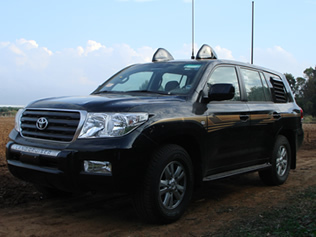 The JAM-V MK4 Toyota Land Cruiser is a specially customized four-wheel-drive luxury vehicle, equipped with a fully-integrated broadband jamming system. The JAM-V system covers, continuously and simultaneously, the RF communication frequencies most commonly used by terrorists to detonate road-side bombs (RCIEDs): 66MHz – 2500MHz. Using the latest jamming technologies, this third generation of JAM-V now features ultra-high RF transmission power of over 1300 watts, resulting a greater radius of coverage around the vehicle. 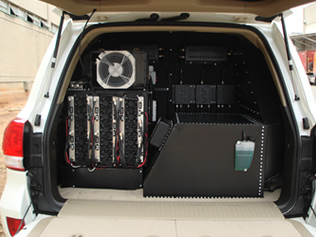 This state-of-the-art RF jamming system is installed in the rear cargo area of the vehicle. The system is powered by a dedicated, specially-customized DC alternator which is integrated with the vehicle’s engine. The system features an integrated “active smart” cooling system which ensures uninterrupted operation in any climate. 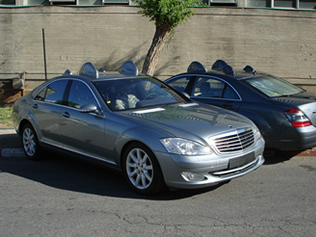 A set of high-gain, omni-directional antennas are mounted on the roof and the rear of the vehicle. Beyond the installation of the jamming system itself, the vehicle is customized with special RF shielding for full protection of the driver and passengers. Optional armoring to level B6 is available for all JAM-V vehicles. The customer may choose any luxury four-wheel-drive vehicle similar to the Toyota Land Cruiser.